Padre Pio was born on May 25, 1887 in Pietrelcina, Italy, and baptized in the name Francesco Grazio. From his early childhood he was visited regularly by his guardian angel and the Blessed Virgin Mary. He did not think this was unusual until a young friend told him otherwise. He was ordained a priest in the Capuchin Order on August 10, 1910. His young priestly life was marked by numerous episodes of poor health, and also included a short stint with the military. After being discharged from the Army in 1918, he was stationed at the monastery at San Giovanni Rotondo, never to leave until his death. On December 20, 1918 he was blessed with the extraordinary visible stigmata of Christ (5 wounds on his hands, feet and side). His priestly ministry was characterized by humility, perseverance and obedience to his priestly duties, especially to the celebration of Mass, hours in the confessional, and spiritual direction. He was able to read into the hearts of many who came to him for confession, often reminding them of unconfessed sins and foretelling future occurrences in their lives and God’s will for them. 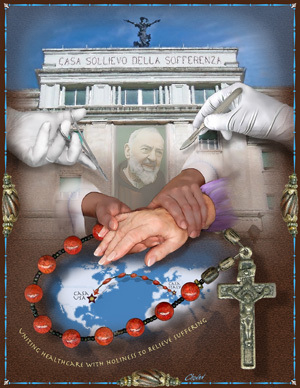 A huge international cult rose up around Padre Pio, manifesting itself in constant crowds of pilgrims to the monastery to attend his Masses and to confess to him.